Pagadian City, the capital of the province of Zamboanga del Sur, is a perfect combination of relaxation and leisure. Dubbed as the "Little Hong Kong of the South" due to its picturesque harbor cove, the city also serves as the regional center of the whole Zamboanga Peninsula. Take a tour in this slice of paradise and experience a blend of urban development and rural life. #1 - Pagadian Bay Plaza Hotel: Established on a hill, this 8-story hotel indeed gives a perfect panorama of the Pagadian Bay. They have affordable yet quality accommodation with each room fully-airconditioned. They also have a swimming pool, elevators, and 3 function rooms that can accommodate up to 250 persons. #2 - EP Executive Suites: Minutes away from the city center and Pagadian airport, this hotel is one of the most convenient choices in the area. Rooms are equipped with new aircon units and have fast wifi access. Though free breakfast is included in the accommodation, they also serve other meals in their cafe and restaurant downstairs. #3 - Hotel Guillermo: Located at the heart of Pagadian City's business center, this hotel is an ideal place for either vacation or business. From executive suites to budget rooms, they can cater to whatever you need. Guiller Cafe located on the ground floor of the hotel also serve high-end cuisine. Walk the off-the-beaten paths of Pagadian City and be enchanted with its different waterfalls. Some of the most popular falls in the city are Lison Valley Falls, a 25-meter cascading waterfall surrounded by giant ferns and wild orchids, Manga Falls, a two-layered waterfall with huge trees that serve as habitat for white monkeys, and Pulacan Falls, a scenic waterfall that covers 400 square meters. Adventurous tourists may also get their fill through hiking mountains. Mt. 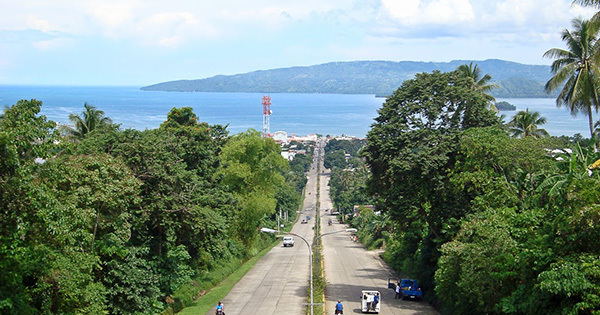 Palpalan which stands 684 feet above sea level gives a panoramic view of the whole city, its neighboring towns, and the deep blue waters of Pagadian Bay. Mt. Susong Dalaga, a pair of almost perfect cones with lush forest cover and Mt. Pinokis, a home for monkeys, are two other mountains. Enter a new dimension in Pagadian City's caves. Manga Caves are twin caves that are also located along Manga Waterfalls. 14 kilometers away from Pagadian is the Kendis Cave, an open-end cave that has lush vegetation and plants scattered over the area. Pagadian City also has its share of beautiful beaches. 10 minutes away from Pagadian port via motorboat is Dao-Dao Islands. Though the coral reefs are artificially made, it didn't lessen the beauty of the island. Other beaches are the Mabait Beach, Muricay Beach, White Beach, and Puting Balas Sandbar, which are all ideal for swimming, fishing, and diving.